...but I've painted my chair! 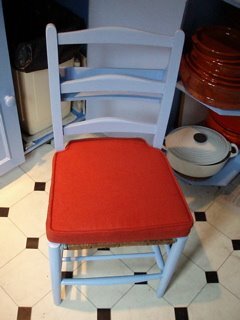 Inspired by my favourite van Gogh painting (to which I cannot find a link which seems odd) I too have painted my favourite chair. The chair was from a boot sale. The paint from B&Q (specially mixed blue eggshell made up by their extremely helpful staff to my demanding requests). The cushion was made by Sally. Beautiful. Of course Vincent would probably not have featured the dustbin in the background but I was so busy admiring my chair I forgot to look at the whole picture. And no, I can't be bothered to take another photo. This was a spur of the moment thing. "motherf***ing snakes on a motherf***ing plane!"